Kopech has easy arm strength with a lightning-quick arm. The fastball was 93-97 mph during this stint, with most at 95-96 mph and late life that got on hitters quick. The breaking ball was 80-82 mph, flashing tight, slurvy rotation with bite at its best. He did make one mistake with the pitch, hanging a 1-2 breaking-ball to a left-handed hitter that was wacked for a triple. He also threw what looked like a changeup at 86 mph that was present average at best. Kopech is a special arm with a potential 70-grade fastball, great pitcher’s frame, and potential plus breaking ball and average changeup. 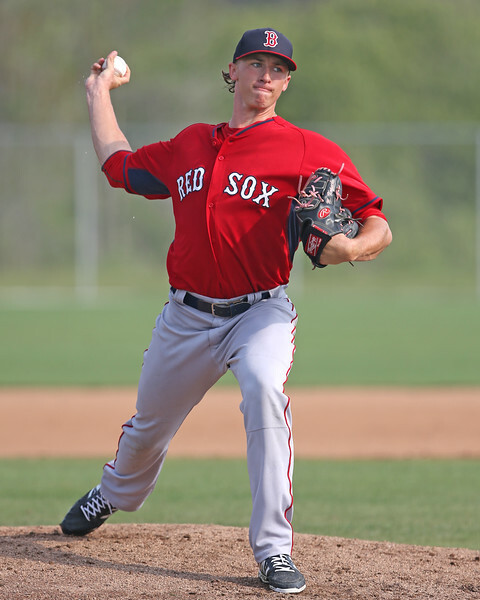 Still young and fairly raw, Kopech’s areas of development should include continued focus on repeating the delivery, fastball command and pitchability with the secondary offerings. 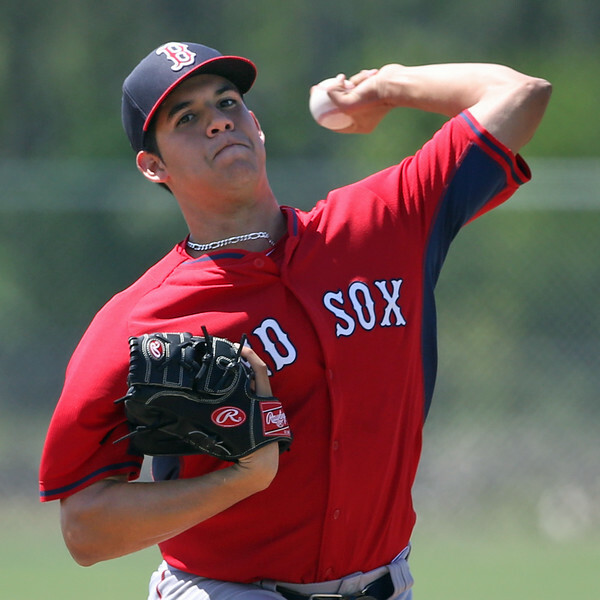 The tools are present to be a potential number two-type starter if everything clicks. Listed at 6-2, 185 pounds, Jose Almonte has an athletic, medium sized build. The 20 year-old right-handed pitcher out of the Dominican Republic worked from the third base side of the rubber with a simple, no-wind-up delivery. His front leg comes up and turns across his body as he gathers himself over the rubber, while arm goes straight back towards his back knee in the delivery and works fine as he releases towards the plate from a three-quarters arm slot. He finishes the delivery smooth out front and gets himself into good fielding position. Almonte threw three innings on Friday and featured a four-pitch mix of a fastball, slider, curveball, and changeup. The fastball was 90-94 mph with most at 91-92. The fastball had some sink when located down in the zone, and he threw one at 88 mph with some cut in on the hands of a left-handed hitter. The slider was 83-85 mph and the curveball 77 mph, with both breaking-balls projecting as fringe-average potential. The changeup was 84 mph and was also fringe-average. Almonte struggled with his release point in his outing and walked a couple batters due to inconsistency with the secondaries. Overall, Almonte is raw and does not project to miss many bats at the higher levels and present below average command and control profile. Almonte is best suited as a future relief profile that should work on the development of one of his breaking balls and continue to work on consistency with the delivery and release point to improve the overall command and control profile. 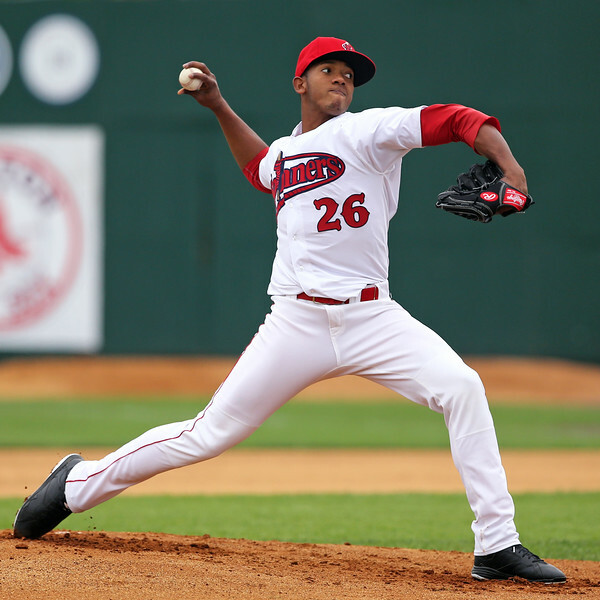 Listed at 6-3, 205 pounds, 18-year-old Enmanuel De Jesus has an athletic, lean frame. The left-hander signed for a reported $787,500 bonus in 2013 out of Venezuela. He came set with his hands at chest height and goes over his head as he enters his full-wind-up delivery, which featured clean arm action and an easy release. In two innings of work, De Jesus threw his fastball at 87-88mph and a below-average changeup at 80 mph where he slowed his arm speed in the delivery. Our reports from last season’s Fall Instructs had him featuring a slider and curveball that he did not throw in this appearance. De Jesus will be entering 2016 as a 19-year-old left-hander with a solid pitcher’s frame and a raw four-pitch mix. Still very raw and far off developmentally, De Jesus is a lower-level lottery ticket that has a long way to go. Photo credit: Michael Kopech, Jose Almonte and Enmanuel De Jesus by Kelly O'Connor.